To me a kitten and cat should have as healthy and happy a life as possible and should contribute to shared peace and pleasure to a home, therefore I focus primarily on my kittens' health and temperament and then appearance i.e. breed to the standard. For this reason all my kittens are desexed, microchipped etc before they leave, also all my breeding cats are tested clear of feline leukaemia (FeLV) and feline AIDS (FIV) plus for every genetic condition for which appropriate tests have been developed so that their kittens will not suffer from these conditions. Eleda Cattery is located in the picturesque hills of Mundaring, approx 35 km north-east of Perth in Western Australia. 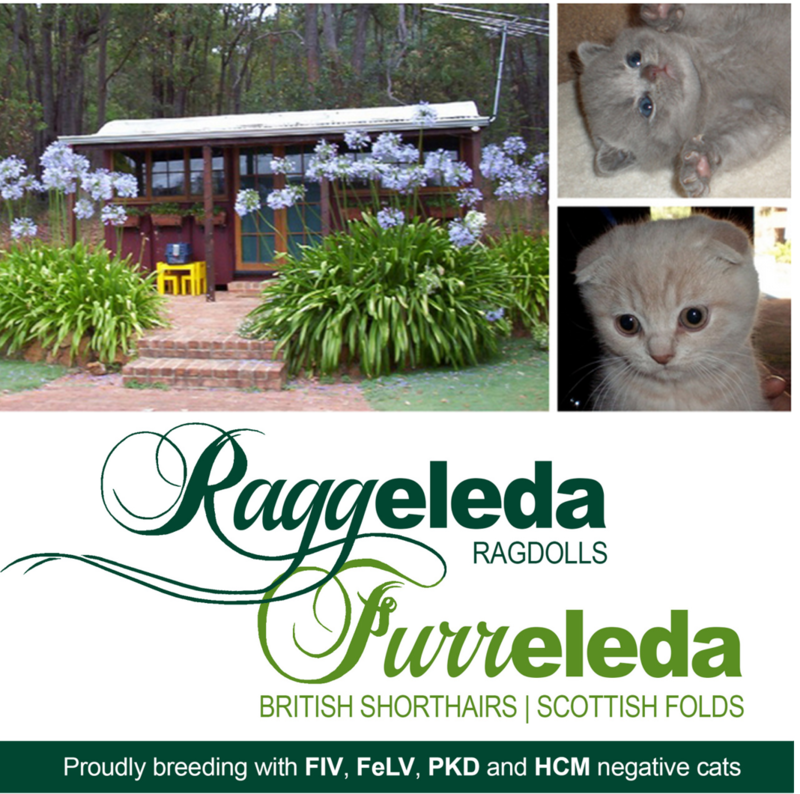 My cattery is a Council Approved Cattery in the Mundaring Shire and I am also a registered breeder with COAWA (Cat Owners Association of Western Australia) under the Prefixes of Raggeleda and Furreleda. I have always had a passion for animals and enjoy all aspects of caring for and improving the breeds I work with, I have an unquenchable thirst for knowledge and thrive on implementing the knowledge I have gained throughout my life by investing it in the health and well being of my cats and the kittens that I produce. For the last 18 years I have been well known for not only my Ragdolls, British Shorthairs and more recently my Scottish Folds but have been very well known as Australia's Rabbit Lady for many years. I ceased breeding rabbits a few years ago so I could concentrate my efforts on producing some new and exciting colours and patterns in the Brits and Folds program which I am thoroughly enjoying doing. At Eleda Cattery, my philosophy differs to most breeders, but it is a formula I have adopted after many years of knowing what works for me, my cats and my clients. I guess I must be doing something right when I have a number of instances when I have provided kittens for up to three generations in the same families and even 8 members in one extended family over about 10 years.